165 ladies take part in a full field for the Autumn Bowmaker and all enjoyed the dazzling sunshine. The sun rose at 7.10 as the first ladies arrived and set at 6.48 as the last ladies were leaving the course. Play started on a dew drenched course in very chilly conditions-7 degrees C-with the rising sun making it difficult to spot balls, but excellent spotters on the first ensured that games started positively with no balls lost as the ladies got into their swing... By the end of the day the temperature was dropping again and the setting sun was still dazzling all. Thanks go to the marshals who toured the course and were able to answer questions and ensure no large gaps appeared. In fact cards just kept rolling in from before 12 until 6.20, so congratulations ladies, just as the manager had predicted when arranging time slots. 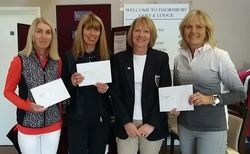 Many thanks to the volunteers, arranged by the County Delegate, Heather, who organised 2 ball draws as so many ladies playing-the juniors have benefitted by £105 from this event, so many thanks. They also helped me maintain concentration by obtaining drinks etc and most importantly with their good humour and support with reading out results during the day. Thanks also to friends, who stayed and helped finish the cards and results until Vicky Watkins arrived. 165 cards had to be entered separately and we all felt "blobbed out" by the end. But what an enjoyable experience meeting several players who have not entered county competitions before - the first of many hopefully as they enjoyed the social side and with food being served from 6.30 everyone was well fed and watered. Many thanks go to all staff at Thornbury, who were so welcoming to us all.